U.S. stock indexes moved higher Wednesday, with the exception of the Nasdaq, as investors welcomed upbeat corporate news and comments from President Obama on the fiscal cliff. 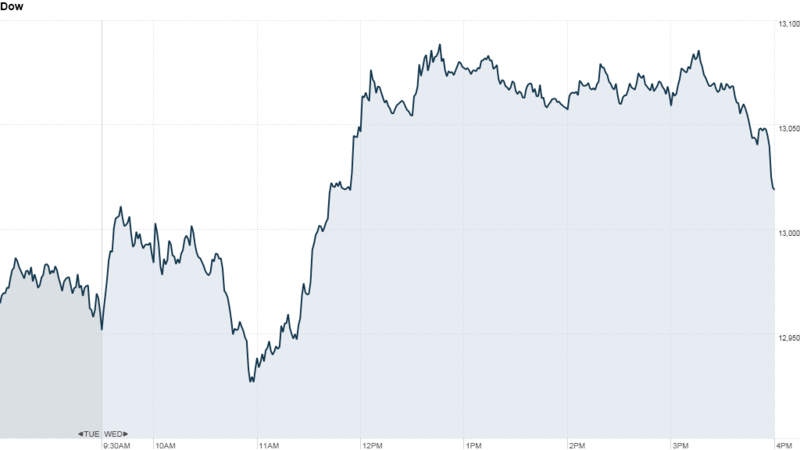 The Dow Jones industrial average gained 0.6%, ending off the highs of the day. The S&P 500 added 0.1%. But the Nasdaq fell nearly 0.8%, dragged lower by Apple (AAPL). Apple shares fell 6% after research firm IDC raised its outlook for sales of tablet computers, pointing to strong demand for iPad rivals made by Google (GOOG), Amazon (AMZN), Samsung and others. There were also reports that clearing firms were raising margin requirements on the stock, which would make it more difficult for investors to keep buying shares. Apple's (AAPL) stock is once again in a bear market, down more than 20% from its all-time high. 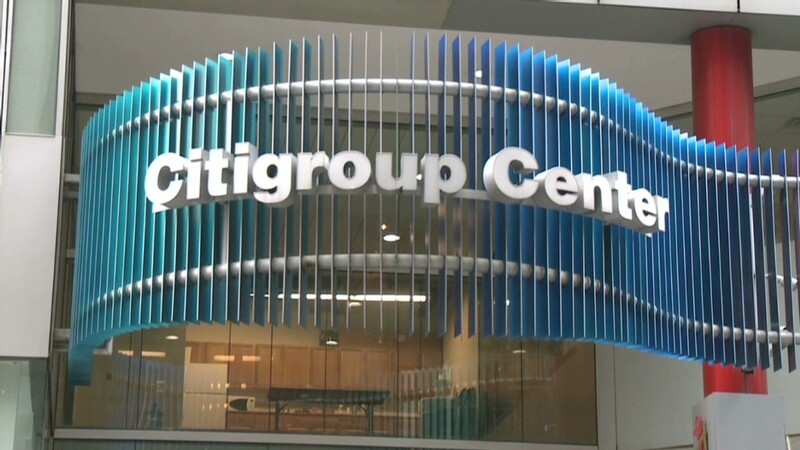 Bank stocks gained after Citigroup (C) announced plans to cut 11,000 jobs and take a $1 billion charge in the fourth quarter as part of a "repositioning" effort under newly appointed CEO Michael Corbat. Shares of Citi rose 7%. Bank of America (BAC), JPMorgan (JPM) and Morgan Stanley (MS) were also higher. Travelers (TRV) rose 5% after the insurance company estimated that net losses due to Hurricane Sandy would total about $650 million. "There's a lot of stock-specific news today," said Dan Greenhaus, market strategist at broker-dealer BTIG. But the uncertain outlook for taxes next year is still the overarching concern, he added. "Pretty much any move you see in the markets these days has something to do with the fiscal cliff," said Greenhaus. Stocks have drifted in a range this week as the fight over tax hikes and spending cuts in Washington shows no sign of progress. President Obama has backed a plan that allows tax rates to increase on the wealthy, while Republicans are more focused on cuts in public spending and eliminating deductions. Obama told members of the Business Roundtable that there has been "some movement" on the Republican side towards allowing rates to rise on high-income taxpayers. If this continues, he said, "we can probably solve this in about a week. It's not that tough, but we need that conceptual breakthrough that says we need a balanced plan." However, Obama was adamant that going over the fiscal cliff for political purposes would harm the economy by jeopardizing America's credit rating. "I will not play that game," he said. The president's remarks came after House Speaker John Boehner conceded that taxes on the wealthy are going up, although he continued to insist that taxes should not rise for anyone other than the top 2% of Americans. On the economic front, payroll processor ADP reported that U.S. private-sector employers added 118,000 jobs in November. That was slightly worse than expected, and smaller than the gain of 157,000 jobs in the previous month. The government reports November job figures on Friday. Economists surveyed by CNNMoney are predicting that 77,000 jobs were added last month and that the unemployment rate rose slightly to 8%. Separately, an index of activity in the services sector of the economy ticked higher in October. New orders for manufactured goods unexpectedly rose 0.8% in October, according to government data. Economists surveyed by Briefing.com had expected a decline of 0.1%. "The economic news today was pretty good," said David Rovelli, managing director of U.S. equity trading at Canaccord Genuity. "If they can get the fiscal cliff organized, we should see a Santa Claus rally at year end. If not, the market will definitely sell off." In other corporate news, mining company Freeport-McMoRan (FCX) announced plans to buy Plains Exploration & Production Company (PXP) and McMoRan Exploration (MMR) in transactions totaling $20 billion. The move, which creates a huge new player in the natural gas market, sent shares of Freeport-McMoRan down 14%. Nasdaq announced late Tuesday that Facebook (FB) will be joining its marquee Nasdaq-100 index next week. Pandora (P) shares plunged more than 18% after the Internet radio service issued a disappointing outlook for sales and earnings late Tuesday. Shares of Nokia (NOK) rose following an announcement that it has partnered with China Mobile to launch a new version of its Lumia smartphone for the Chinese market. Overseas markets were boosted by comments on the economy from China's new leadership. The Communist Party's politburo said the economy was "stabilizing and positive elements are increasing," and it promised further reforms. European markets posted solid gains, while Asian markets had a banner day, with indexes in Shanghai and Hong Kong adding more than 2%. Shares in Ping An were up after HSBC (FTRXX) announced the sale of its stake in the Chinese insurer. In the commodities market, oil and gold prices were lower. Bond prices rose, with the yield on the 10-year Treasury note falling to 1.59%.